Paddy Barnes believes his elite amateur experience will be key when he takes to the ring on Saturday night at the SSE Odyssey Arena. Belfast native Barnes features on a stacked undercard in support of his friend and MTK Global stablemate Carl Frampton, who returns to the ring in a headline featherweight bout against Mexico’s Horacio Garcia, live on BT Sport and BoxNation. Barnes had hoped to defend his WBO European flyweight title for the first time on the bill, but complications surrounding potential opponents has led to a change of plan and the three-time Olympian will instead fight for the WBO inter-continental strap over 10 rounds as he bids to boost his world ranking. Experienced Nicaraguan Eliecer Quezada (21-6-3) will be the man in the opposite corner and Barnes admits that he faces a tough test in only his fifth professional bout since turning over to the paid game last year. Quezada twice defeated compatriot Yader Cardoza, who pushed Jamie Conlan to a split decision last March. That marked Conlan’s last ring outing ahead of his first world-title shot against Filipino IBF super-flyweight champion Jerwin Ancajas on Saturday night. However, the 30-year-old Barnes – a two-time Olympic medallist and European amateur champion – insists that his amateur pedigree will stand to him this weekend. Barnes is back in action just a few weeks after recording his fourth pro win in Edinburgh when he claimed a six-round points victory over Peruvian Juan Hinostroza. Rio Olympian David Oliver Joyce is looking forward to a Team Ireland reunion on Saturday night’s massive ‘Frampton Reborn’ fight card in Belfast. Six-time Irish Elite amateur champion Joyce (4-0) has his fifth pro fight this weekend – competing in a six-round lightweight bout against Barcelona-based Nicaraguan journeyman Reynaldo Cajina – in support of former amateur rival Carl Frampton, who headlines against Mexican Horacio Garcia at the SSE Odyssey Arena. An exciting fight bill also features a number of Joyce’s former Irish High Performance amateur team-mates, including Paddy Barnes, Tommy McCarthy and Jamie Conlan with the latter challenging for his first world title. Joyce and Frampton fought a series of dramatic amateur bouts before ‘The Jackal’ turned pro in went on to become a two-weight world champion as a pro back in 2009. Mullingar native Joyce waited eight years to follow his old friend and foe into the paid ranks, making his debut last June. 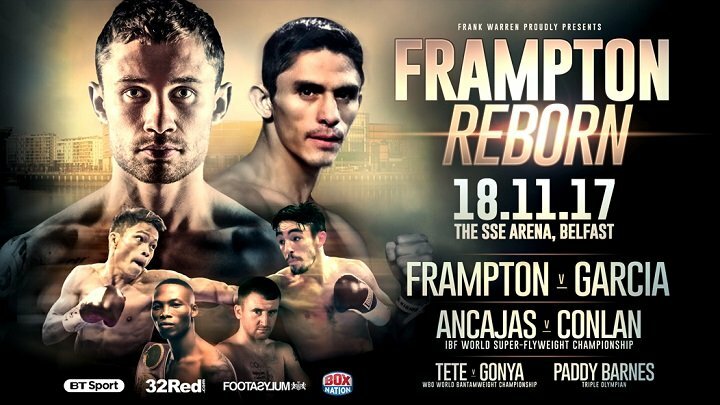 Saturday’s card marks Frampton’s return to the ring after a first pro loss to Leo Santa Cruz last January and Joyce believes ‘The Jackal’ will be back to his best having come through some tough sparring against the Belfast star. Next boxing news: Tyson Fury-David Price in 2018? Both men want it!